​Live where the finest of fairways. Live where the finest of fairways meet the bluest skies. A modern golfers getaway. Horizon is a golfers condo haven with well-planned three bedroom units following a contemporary minimalist design facing the Midlands golf course. 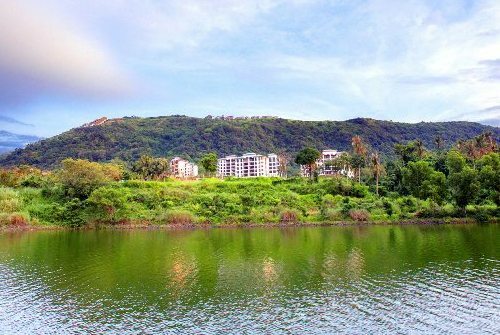 Terraced on gently sloping terrain, it offers magnificent views of Taal Lake and Volcano. This master-planned family oriented development features its own putting green, hallway golf bag lockers, an Infinity pool and lush landscaped gardens.Horizon is approximately 800 feet above sea levelIt stands on 5.8 hectares of landThe community has six buildings, with five residential floors each Horizon has a total of 108 units. ​This golfers' haven is overlooking the Midlands gold course, Taal Lake and Mt. MakilingThe HorizonBecause having a sanctuary is important to our overall state of well-being, HPI decided to build The Horizon, which takes from the traditional Japanese approach to design. It is the companys answer to the modern world of noise, crowds and pressing deadlines where senses are pampered with silence and wellness is deeply engrained into ones personal living space. Located inside the Tagaytay Midlands mountain resort community, The Horizon is a medium-density residential condominium development that eases into the terrains gentle slope, blending seamlessly with the landscape around it. Designed by Recio + Casas Architects, each of the five-storey buildings uses graceful angles to form private, tranquil enclaves for each of its 18 three-bedroom units, allowing residents space to connect with nature and with themselves. The play of space is important at The Horizon. Its penthouses, for example, feature 5.5-meter high ceilings, encouraging the mind to open up and be free. And though each of the 108 units in this exclusive neighborhood has approximately 137 to 150 square meters, all their rooms have floor-to-ceiling windows that open up to a contemplative view: the Taal Lake and Volcano in the southwest, Mt. Makiling in the southeast, and the Batangas mountain range in the south. This is condominium living without confinement, a take on the modern lifestyle where all of nature is in abundance. Nowhere else do rooms stretch as far as the eye can see.Every detail in The Horizon encourages mindfulness and tranquility. Unit interiors blend materials from the earth -- ceramic tile flooring, granite kitchen countertops and solid wood doors --with technological conveniences such as air conditioning systems, recessed lighting fixtures, classic bathroom fixtures, and even an emergency power system. Everything, it seemed, has been meticulously planned so that homeowners need not think of anything else: there are maids rooms with their own toilet and bath, sufficient closet spaces, two assigned parking slots, elevators, hot water supply, and a common drivers quarters.